Maybe your teacher is effortlessly cool — naturally wavy hair falling to her low back, a stunning floral tattoo gracing her upper shoulder, and one of those hoop-style nose rings. She gives you a warm hug every time you see her and drops the most amazing little nuggets of wisdom whenever you’re in half pigeon. Or maybe it’s like he’s your own personal cheerleader with a rock solid knowledge of anatomy and physiology and an easy laugh that always makes you feel like you belong. His classes are packed with positivity and his Instagram is all green juice, fancy asanas, and off-the-beaten-path travel pics. No matter who your teacher is, I guarantee there are a few things she’d never tell you (unless maybe you thought to ask and she really felt safe to speak her mind) but that she kind of wishes you knew. #1: She probably attends fewer in-studio classes per week than you do. Often when studio classes are scheduled, she’s either teaching a class herself or working at her other job — you know, the one that actually pays the bills. Speaking of bills, sometimes she just can’t afford to attend class regularly if she doesn’t have a complimentary membership somewhere. #2: Sometimes the expensive gear really is worth it. I HATE recommending a mat that I know costs $70, but when I finally upgraded from the crummy “sticky” mat I bought at Target, it completely changed my practice (no lie). Blocks, bolsters, and straps or athletic garb that will truly support your practice (like a sports bra that actually fits, does its job, and feels good) are worth the investment. Not everything is just hype. #3: He does things other than yoga to keep his body feeling good. I feel like the yoga mafia may come after me for this one. I hear lots of teachers confidently declaring that you can maintain your physical body with yoga alone (or that you should practice #everydamnday). The truth is that what works for one person may not work for another and yoga is not the be-all-end-all. I see it all the time with my bodywork clients — devoted yogis practicing 5-7 days a week for years who then finally take a little vacation and come to see me after 10 days without setting foot on their mat saying, “I can’t remember the last time I felt this good.” First — YIKES! Pay attention to that feeling. Your body is sending you a message. 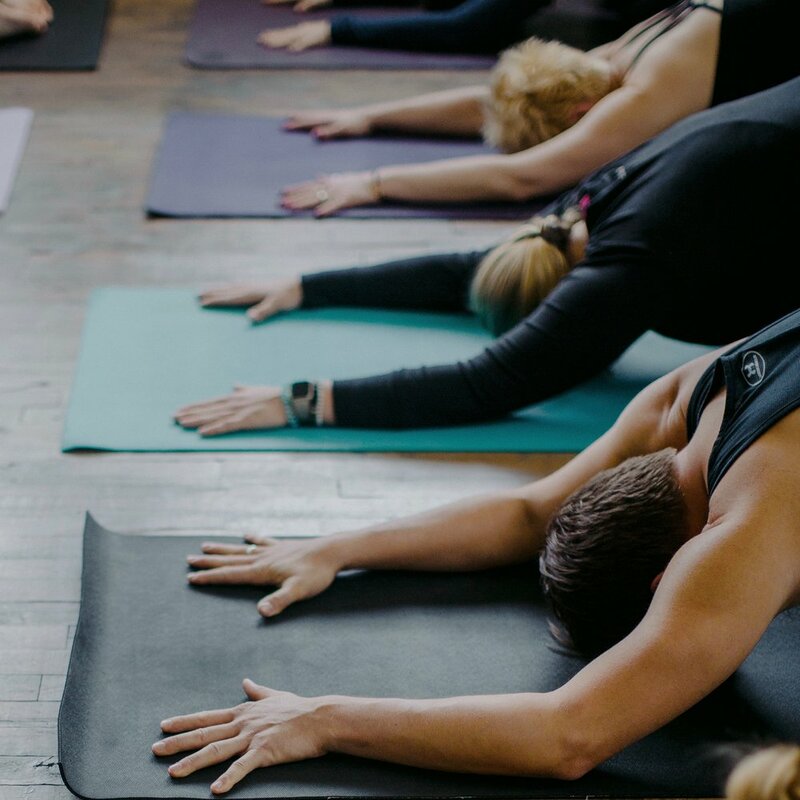 Second, having another practice that nourishes your physical body — lap swimming, lifting weights, regular bodywork, barre classes, whatever — is so important. Your teacher probably has one too — especially because being a teacher can sometimes make being on his mat feel a little like he’s at work. #4: He gets pissed off in traffic (or wherever). There are places his yoga just doesn’t always reach. Surprise! You don’t get automatic, lifetime access to a spirit of equanimity when you graduate from your 200 hour teacher training program. Stuff still makes him irrationally angry and impatient, sometimes he still acts like a complete jerk, and he still often forgets how to breathe and widen that moment of *pause* between stimulus and response. It’s because he’s still a human being, just like you, and it’s all okay. #5: She doesn't always love her body. This one’s a doozy, y’all. I’ve practiced with a body 20 pounds heavier than I am now and with a body 25 pounds lighter than I am now. Yoga works no matter what my body or my poses look like. But that doesn’t mean that it’s always easy to accept the limitations that sometimes arise from the post-traumatic arthritis in my left ankle (more on this in a future journal entry). And it doesn’t mean that I don’t sometimes get critical about how my body looks, feels, or moves while I’m on (or off!) my mat. #6: He does have favorite teachers and studios, but it doesn't feel okay (or professional) to admit it. The truth is that some teachers and some studios just rub us the wrong way (and, sometimes, it’s more than just personal preference — it’s teaching that is straight up lazy or anatomically misleading), but we would NEVER talk smack about another teacher so our lips are sealed and we’ll be taking those feelings to our GRAVES. Most of the time when my students ask me about other teachers or studios, I say that yoga’s a lot like ice cream — my favorite might be dark chocolate fudge and yours might be mint chocolate chip and that’s totally okay (and sometimes, I might just really want mint chocolate chip even though I’m normally more of a dark chocolate fudge kind of girl). But the truth is that I have my favorites (and not-so-favorites) too. So, there you have it — 6 things your yoga teacher (probably) won't tell you. Remember this little peak behind the curtain the next time you start to feel like your teacher is so much cooler, more peaceful, or just better than you are somehow. We’re all human and — hopefully — doing our best to be kind, curious, and brave during our little stint here on this planet.